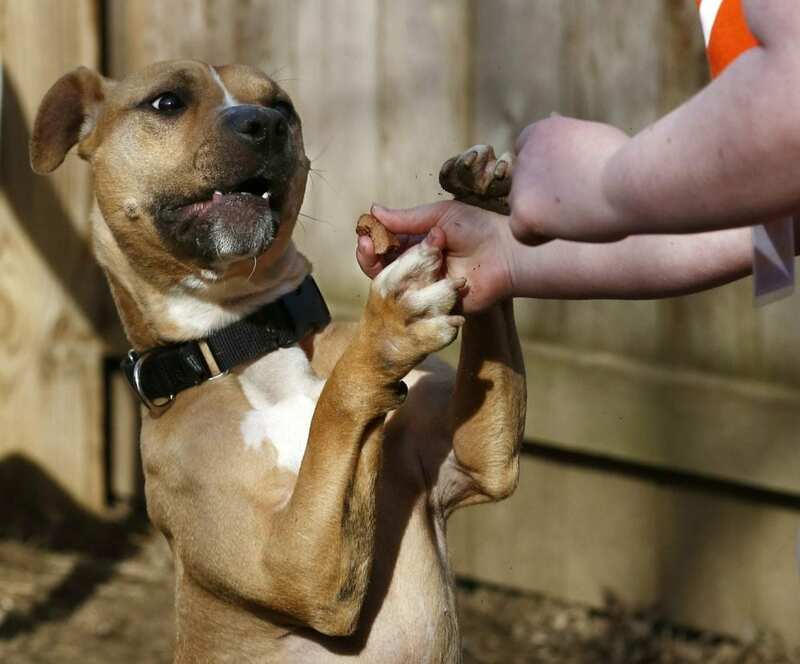 COLUMBUS, Ohio (AP) — Seventh-grader Rebekah Weiner volunteers weekly at Columbus Humane, walking dogs, cuddling cats and playing with lonely animals. The 13-year-old has always had a passion for helping creatures, large and small. Rebekah Weiner couldn’t contain her giggles as she watched the 1-year-old pit bull frolic in a fenced-in area behind Columbus Humane. She tossed a tennis ball to the rambunctious Nova — who sometimes returned it and sometimes didn’t — and treated the pit bull to a doggie bone despite the pup’s inability to “sit” for any length of time. And Nova wasn’t the only dog the 13-year-old volunteer couldn’t say “no” to during a recent visit to the Hilliard facility. Prismo, a 5-year-old orange-and-white mix, got a long walk; Honey, a 5-year-old pit-bull mix, got extra kisses and head pats because she’d recently had surgery. For the dogs that she and her mother, Megan, didn’t take outside for playtime, Rebekah made sure to speak to each individually in their kennel. “Hi, pretty!” she said to yellow lab Scout. Several others got “You’re a good boy!” as she bent down to pet them through the chain links. That’s where she comes in, volunteering at the animal-welfare organization to make creatures comfortable until they are adopted. Since the fall, the animal lover has visited Columbus Humane at least weekly alongside her mother — volunteers under age 16 must be accompanied by an adult — walking dogs, snuggling cats, talking to lonely animals and even cleaning up animal feces. “I don’t really like doing the poop,” Rebekah said with a laugh. But it’s a job she’s willing to do to care for these animals waiting to find homes. Weiner said her daughter had been counting down the days until she turned 12 and was old enough to officially volunteer. Then the pair went through 22-plus hours of orientation and training. Prior to that, she brought Rebekah at least once a month to pet and play with the cats, just for fun. Animals, Weiner said, have always been Rebekah’s thing. “She has cerebral palsy, and she was 9 months old before she even rolled over, and she only rolled over to pet the cat,” said Weiner, who lives on the West Side with her daughter, their three cats and an albino gecko. When Rebekah was younger, her mother said, she made a “hospital” for ants that may have been stepped on, and just last summer she needed the rabies vaccine after a bite by a bat with a broken wing that she tried to save. Besides tapping into one of Rebekah’s passions, volunteering with animals has helped her come out of her shell, her mother said. Rebekah is one of the most active teen volunteers at the facility, said Amy Stover, Columbus Humane’s volunteer program manager. Since October, she’s put in more than 70 hours. “If you think of the crazy hours kids have with sports, school, activities, this just shows me she’s really dedicated,” Stover said. And while 18 percent of the organization’s roughly 450 volunteers are teens, few of them have committed to the mission like Rebekah. At first volunteering was difficult for Rebekah because she wanted to bring all the animals home with her. She got attached, and when one would get adopted, she’d cry, her mother said. The middle-schooler recalled one of the first cats that made an impression on her, an 18-pound cat named Silent. Rebekah said she’s not sure why she loves animals so much, but she does know that she enjoys helping them, even though she has to eventually say goodbye. Be the first to comment on "Teen Pours Affection For Animals Into Volunteering"